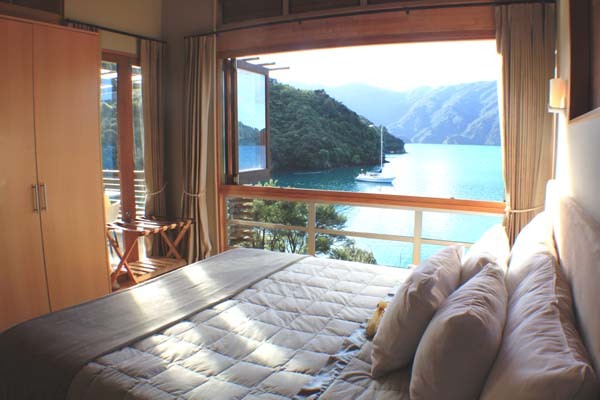 We collect you from your accommodation in Picton this morning, introduce you to your Wilderness Guide and then depart on the boat trip to Ship Cove. Learn about the fascinating marine life of this area along the way and, if we are lucky, see dolphins as well! Begin your guided walk at Ship Cove. This scenic and historic reserve was a favourite anchorage for Captain Cook during his explorations in the 1770s as well as being a site of significance for local Maori. Bush is mainly a mixture of stunning podocarp and beech forest with punga ferns and other New Zealand native foliage. This day is regarded as the premier section of the Queen Charlotte Track. At days’ end, transfer by scheduled water taxi to the Bay of Many Coves Resort, your accommodation for the next three nights. Your luggage will be waiting. We will collect you by scheduled water taxi this morning and transfer you to Furneaux Lodge where the walk begins. Today’s coastal walk takes you through mostly regenerating native bush to the call of bellbirds, fantails and other New Zealand native birds. The track begins through native bush and traverses a small swing bridge to the head of Endeavour Inlet. Pause there to learn more about antimony and the mining industry that thrived there in the 1880s. Follow the main track onwards and into Big Bay where pristine native beech forest awaits before working your way towards Camp Bay and Punga Cove. Enjoy a coffee or cold drink at the Punga Cove waterfront bar before collection by water taxi and return to Bay of Many Coves Resort. Transfer by private water taxi this morning to Torea Bay and return to the ridgeline to continue your hike along the Queen Charlotte Track. A challenging but rewarding day on the ridgeline between Punga Cove & Torea Saddle. Truly grand views abound round every corner – a wonderful reward indeed. Stare in awe at the sunken river valleys of the Marlborough Sounds from the iconic Eatwell’s Lookout. At different times you can see both the Queen Charlotte and Kenepuru Sounds as you walk. This is a truly spectacular section of the track. Those who feel like a day’s rest today can opt for a day of relaxation at Bay of Many Coves or enjoy a private guided sea kayak tour with Wilderness Guides from the resort (additional cost). If walking, you conclude your journey at Camp Bay and return by scheduled water taxi to Bay of Many Coves Resort for your final evening there. Farewell Bay of Many Coves Resort for the final time and transfer by private water taxi to Torea Bay. Ascend to the ridgeline once again, enjoying stunning views back towards Picton as well as into the turquoise waters of the Kenepuru Sound. Open farmland and a grand native bush section to finish is a fitting finale after four days of walking. Take time for a photo stop at the picturesque Davies Bay – you won’t want the journey to end. Today you return by boat from the Anakiwa Jetty to Picton, arriving back to Wilderness Guides HQ by late afternoon. 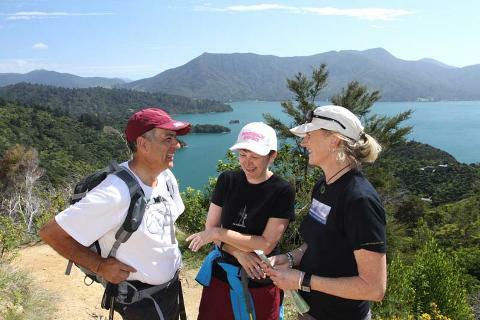 At the conclusion of your walk, only 5 minutes from the end of the Queen Charlotte Track, add a night or two (additional cost) at The Sounds Retreat Luxury Lodge, an award winning exclusive accommodation where nature, design and service meet to create the perfect experience to complete your Queen Charlotte Track walk.